Gaby Pacheco was one of four immigrant youth who in 2010 launched a four-month, 1,500-mile walk to urge then-President Barack Obama to stop deportations of young immigrants and their family members and to pass the DREAM Act. The DREAM Act proposal offered young undocumented immigrants a path to legalization, and they called the walk the Trail of Dreams. As they made their journey from Miami to Washington, DC, news outlets picked up the story and started referring to the four young activists as the “DREAM walkers” and “students.” At one point, one of the “walkers” delivered a speech where he identified the group as “dreamers,” says Pacheco. “I use the term [DREAMer] and probably will for the rest of my life,” says Pacheco, who in April 2013 became one of the first unauthorized immigrants to testify in front of Congress. The word helped the general public connect with the “walkers” and what they were fighting for, Pacheco says, though immigrants have been referred to as dreamers long before the DREAM (Development, Relief, and Education for Alien Minors) Act was introduced in 2001. But immediately after the act’s introduction, young people helped popularize the new understanding of the word DREAMer, in online forums and in popular media they produced. Now, it seems like everyone—from The New York Times to Fox News to the country’s largest Spanish-language networks and newspapers—refers to young immigrants as DREAMers. Elected officials from all sides of the aisle regularly mention DREAMers too, from Democratic Sen. Kamala Harris of California to President Donald Trump. A range of publications, from more conservative websites to more liberal sites targeting young readers, regularly use the term DREAMer to describe young undocumented immigrants. But in the years since the DREAM Act was first proposed in 2001, some of the most visible immigrant rights activists who identified as DREAMers and advocated for the bill now say the term may do more harm than good because the concept is rooted in exceptionalism. To be eligible for the proposed path to citizenship under the DREAM Act of 2011, undocumented youth would have to meet very specific criteria: They must have entered the country before the age of 16 and not be older than 35; they can’t have any serious convictions and must be law-abiding citizens with “good moral character”; and they must have at least a high school diploma. The latest version of the DREAM Act only requires undocumented youth to have entered the U.S. before the age of 18. The high school diploma requirement itself eliminates many young immigrants from qualifying for the DREAM Act. Among undocumented immigrants ages 25-64, 47% have less than a high school education. By contrast, only 8% of their U.S.-born counterparts have not graduated from high school, according to Pew Research Hispanic Trends Project. 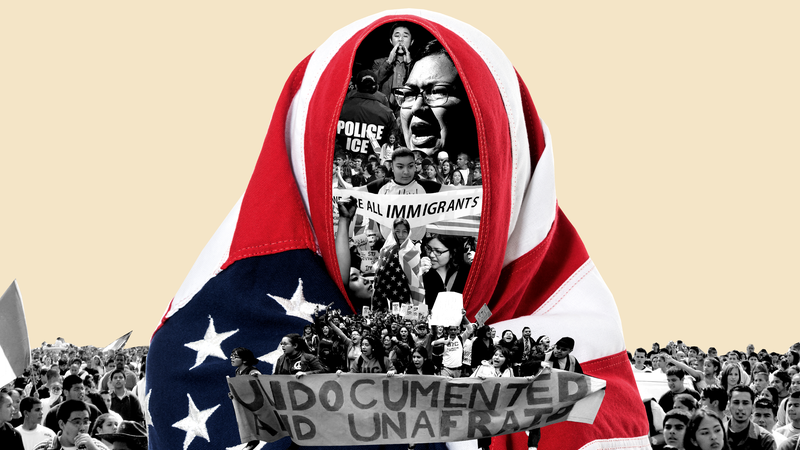 “Identifying as a DREAMer was a political and strategic decision,” says Tania Unzueta, who in 2010 participated in an act of civil disobedience that The New York Times referred to as “the first time students have directly risked deportation” to pass legislation that would benefit immigrant youth. Unzueta was one of a handful activists who walked into Senator John McCain’s Tucson office demanding he support the DREAM Act. The activists staged a sit-in inside McCain’s office until they were arrested. “It makes some immigrants more deserving and others undeserving—and there’s a lot of dangers to that,” says Ju Hong. Hong, who was born in South Korea, made national headlines in 2013 when he interrupted then-President Barack Obama during a speech in San Francisco. “You have a power to stop deportation for all undocumented immigrants in this country,” Hong shouted at Obama. Hong came to the U.S. on a tourist visa at the age of 11. Once his visa expired, he became undocumented. Because he entered the country at a young age, he can take advantage of programs that protect young immigrants from deportation, like DACA. His sister, however, was 16 when she came to the U.S., making her ineligible for federal protections. After Hong interrupted Obama, Fusion interviewed him and published a story that identified him as a DREAMer in the headline. But Hong doesn’t identify as such. The AP sometimes uses the term “dreamers” in quotes. The AP Stylebook, widely adopted in newsrooms across the globe, advises reporters to avoid the terms “DREAMer” or “Dreamer” only when referring to young immigrants with DACA, Deferred Action for Childhood Arrivals, the administrative program introduced in 2012 that provides temporary protection from deportation to some young immigrants. Going forward, Splinter will no longer identify young undocumented immigrants as DREAMers. Instead, our style guide urges writers to ask more precise questions and articulate the subject’s immigration history in the story. In recent years, some young people with DACA have adopted the term “DACAmented” to describe their status, though it has yet to be widely adopted. Some young, undocumented immigrants still support the term and identify as DREAMers. The Splinter style guide leaves room for that, too. We will always defer to an individual’s preference for identification, as long as it’s factually accurate. Update: This post was updated to clarify that the DREAM Act requirements mentioned originate from the 2011 version of the proposal. This post is part of Splinter’s series on our house style guide, a living document spearheaded by senior copy editor Daniel King and crowdsourced from editorial staff across our teams for input on words’ accuracy. Reach us at styleguide@splinternews.com.